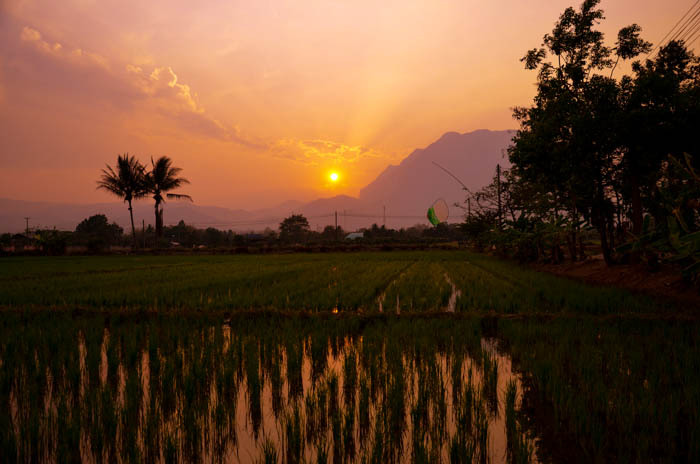 Chiang Mai as a city offers mostly markets and temples, so if you come here and plan to stay for more than just a few days you will need some ideas for the things to see and do. 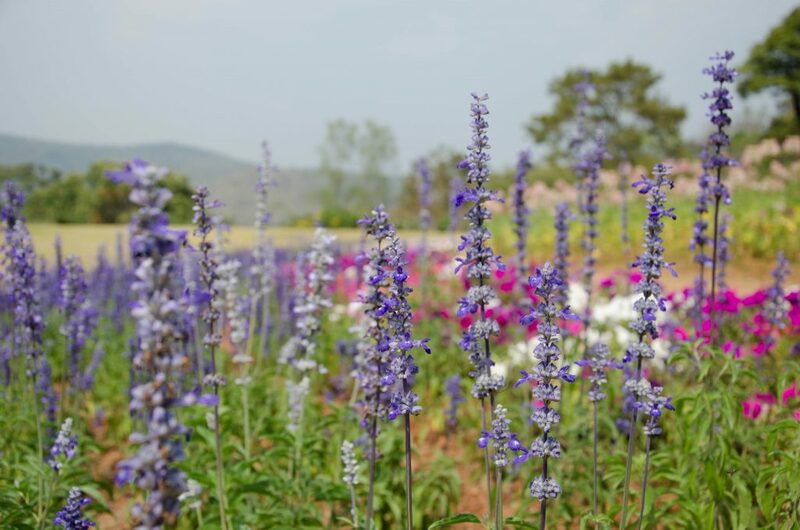 There are a lot of options for day trips around Chiang Mai to keep you busy. Most excursions can be done by a motorbike. You can also buy a tour from one of the operating tourist offices in the city, or hire a songthaew driver to take you to your chosen destination. 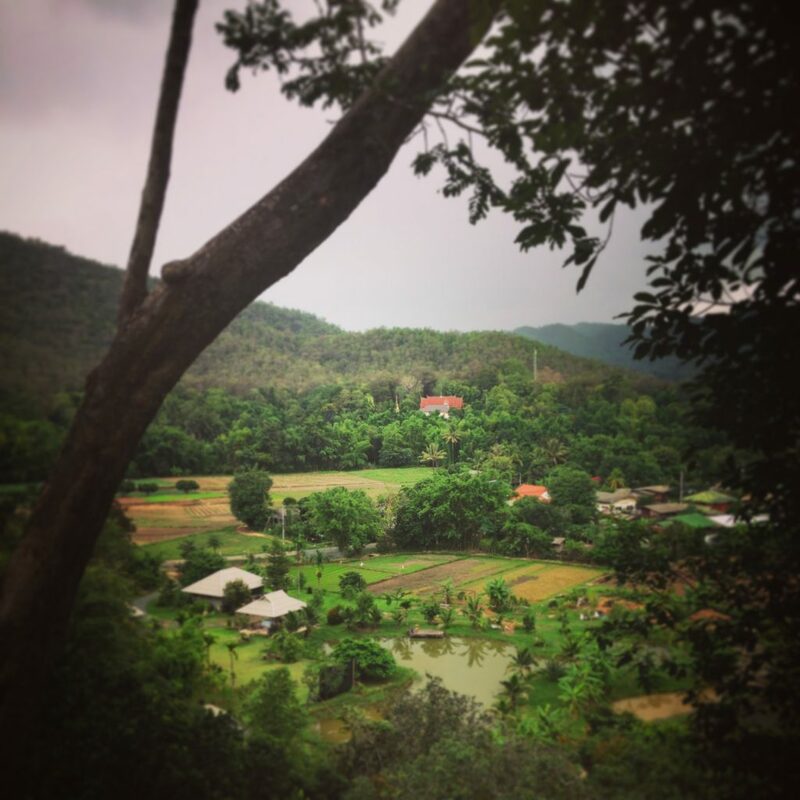 Here are my favourite 6 options for day trips around Chiang Mai. Mae Sa Waterfall is one of the biggest waterfalls in the area. 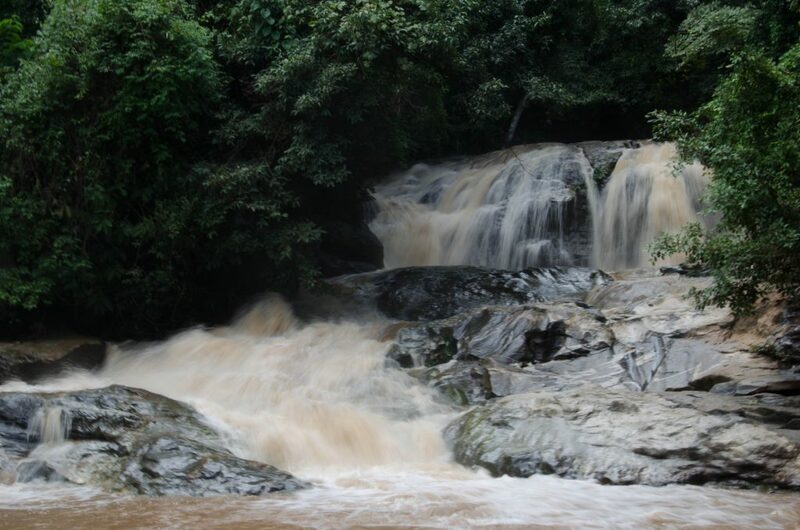 Mae Sa Waterfall is a place that is becoming more and more popular with tourists. A songthaew here costs around 500 Baht, but the site is easily accessible by a motorbike, too. The road here goes through some really busy parts and turns left to take you a little away from the traffic. From there it is a very pleasant ride. 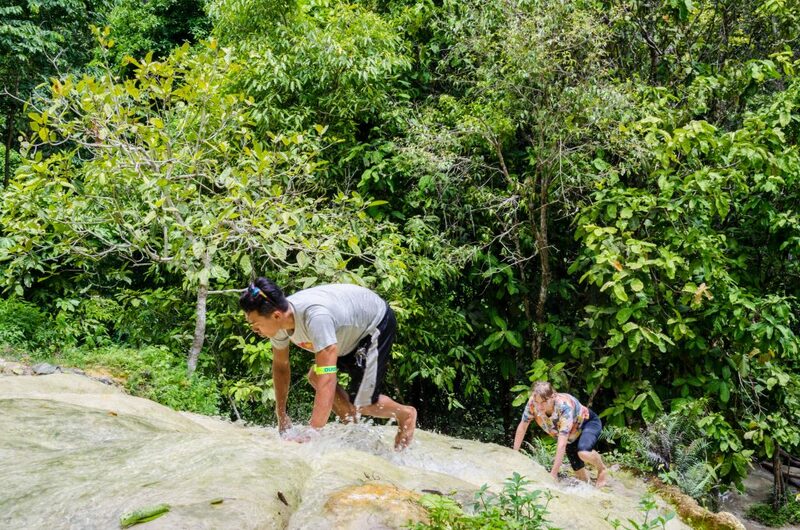 Before you reach the waterfall you will pass at least one elephant park and a place, where you can see monkeys riding bikes and performing other tricks. I will leave this to your own choice, but if you love animals I would avoid both of these places (please see the Elephant Nature Park section below). Download a free plan for your 2 week holiday in Thailand! The entrance to the waterfall is clearly marked and it is impossible to miss it. There are several food stalls in the parking area as well as shops, selling all kinds of souvenirs. The climb to the waterfall is not too hard, but not too easy either. There are 10 different levels for you to enjoy. 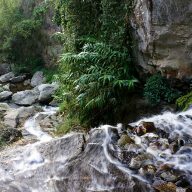 The top of the waterfall is too dangerous to swim, but you can enjoy the cool water on level 5, where you can find some good spots for a picnic. Entrance Fee: 100 Baht, plus 20 Baht for a motorbike. Directions: From the north side of the city take the Changpuek Road. Cross the superhighway towards Mae Rim. Continue north on highway 107 for about 13 kilometres. After you reach Mae Rim, drive for another 1 km. You will see a sign for a waterfall. Turn left onto 1096. After about 5 km you will reach the entrance to the waterfall. If you continue to drive up the hill from the Mae Sa Waterfall after around 20-30 minutes you will reach the Queen Sirikit Botanic Gardens. I am not a big fan of plants in general, but it is always nice to have a look at different exotic trees and flowers. The Botanic Gardens are quite big and you might be advised to drive your motorbike instead of walking. There are some pretty hills with benches for you to enjoy the views. The garden is full of colourful flowers. The main part includes some greenhouses, fountains, ponds with fish and the most amazing orchids and lilies I have seen in my life. There is also a viewpoint, which might not be that impressive, but it’s still nice to enjoy the serenity. After you visit the gardens and have some time to spare drive further up the hill. The air will become cooler and you will see less and less buildings, cars and people. 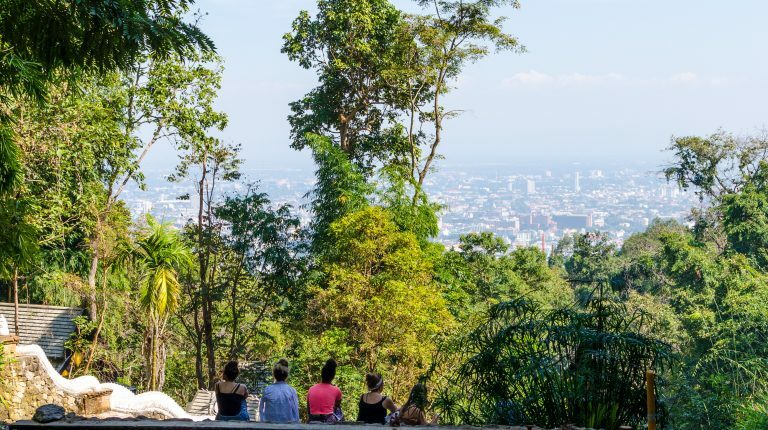 After a while, you will reach a nice viewpoint, where you can take a rest and think of your next destination. Many visitors continue to drive further to Samoeng, where they can stay overnight or follow the signs to Chiang Mai, completing so-called Samoeng Loop. Thais love to come here and enjoy their time with their families. When you pass the Botanic Garden and follow the road for another few kilometres, you will see signs pointing to Mon Cham. 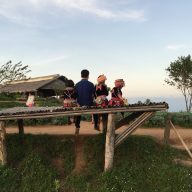 This is a small village on a top of the mountain, where you will find Nong Hoi Project. 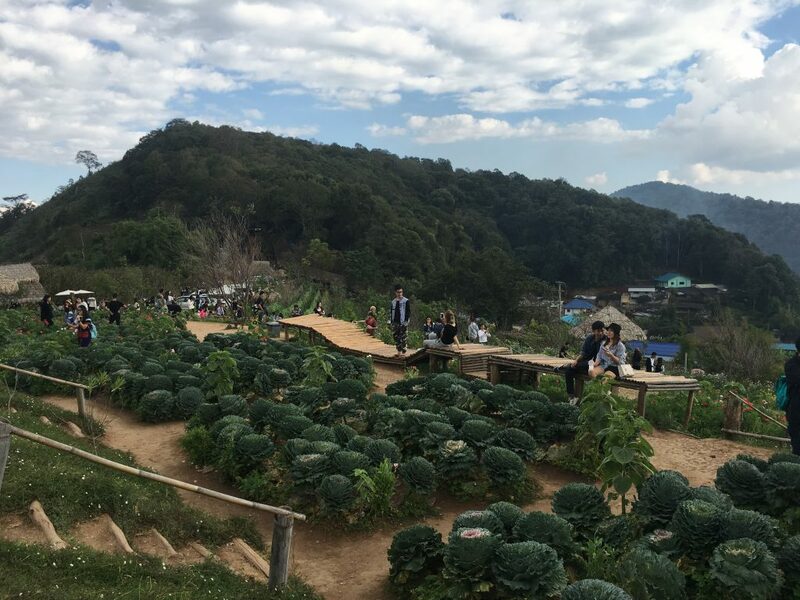 It’s a small garden, where minorities from the area grow their vegetables and fruit. You can spend a whole day here admiring the views and enjoying delicious, fresh, local cuisine from the restaurant, located right in the middle of the garden. You can read more about Mon Cham and Nong Hoi here. You can climb up from the bottom of the waterfall to the very top of it. Another great idea for a day trip around Chiang Mai and from its pollution. I have written everything you need to know about this site here. This waterfall is not as impressive, but the climbing up its sticky rocks and the roads leading to the site make it worth the drive. You can get there by scooter, or taxi, or hire a local guide. You can book your trip with Take Me Tour, which is an amazing company that allows local people work as guides. I used them for my trip to China Town in Bangkok and I must say that was very happy with their service and the quality of the trip. You really get a great experience at a very affordable price. Just visit their website and book one of their tours. 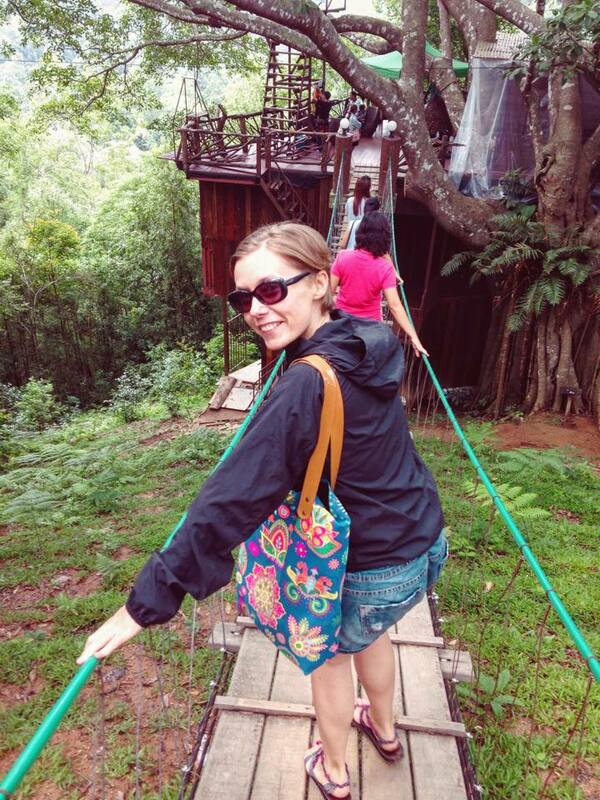 They offer a great array of trips both in Bangkok and in Chiang Mai. You can really interact with these amazing animals. This is an opportunity for you to do something good. Elephant Nature Park was established by a lady called Lek, who rescues elephants from logging and tourist industries. It is not allowed to ride elephants here and you learn why during your day at the site. Elephants are beaten and tortured before they are used to beg on the streets or to entertain tourists. Very often they are injured and get sick. Their young ones are taken from them at a very early age causing a huge distress to the mother and the child. 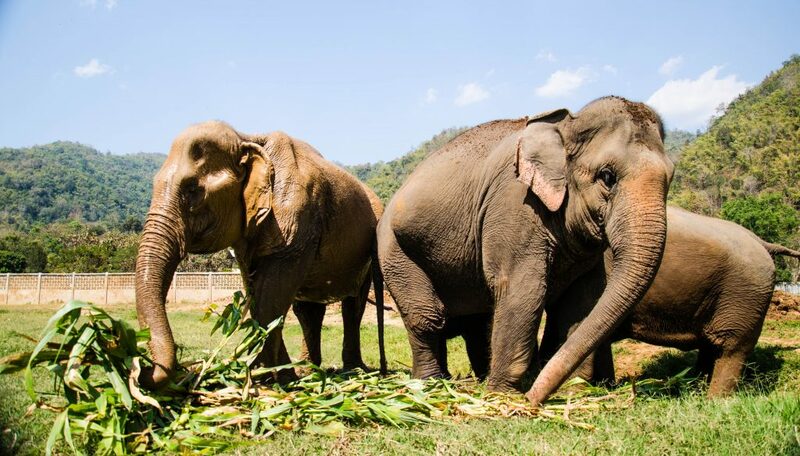 Lek travels all over Thailand and provides care for the sick animals and, if she can take over from the owners, she takes the elephants to her sanctuary, where they can roam free. 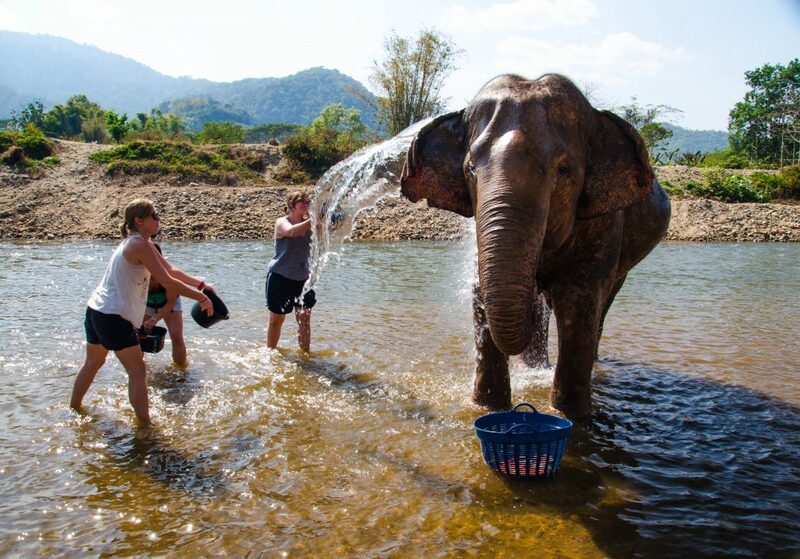 At Elephant Nature Park, the tourists have an opportunity to walk with the elephants, feed them and even bath them in the river. It is a fun, informative day. There is nothing more exciting than getting so close to an exotic animal. Lunch is provided and during the free hour, you can watch a documentary on Lek’s work. The only way to spend the time with the elephants is to book a trip with the Park directly. You can do it online, or at their office, which is just next to the Tae Pae Gate. There are different packages to choose from. Recently a few more elephant sanctuaries have been created in Chiang Mai. If you can’t book a place with Elephant Nature Park, you can try a different centre. Book your trip with Take Me Tour, where you get a genuine, local experience. Take Me Tour organises trips with local guides, who work independently. This way you can avoid organised tours and enjoy something truly unique. You can chill in these huts whole day. Huay Tung Tao Lake is my favourite place for a short trip around Chiang Mai and I visit it quite often, especially on a weekend. 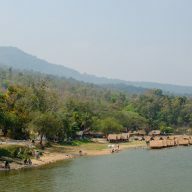 The lake is a short motorbike ride from Chiang Mai. I have not seen songthaews driving here, but I am sure you can hire one for a day if you need to. However, driving a motorbike to and around the Huay Tung Tao Lake is more than pleasant. The water is surrounded by the mountains and the sight is beautiful no matter what time of the year it is. 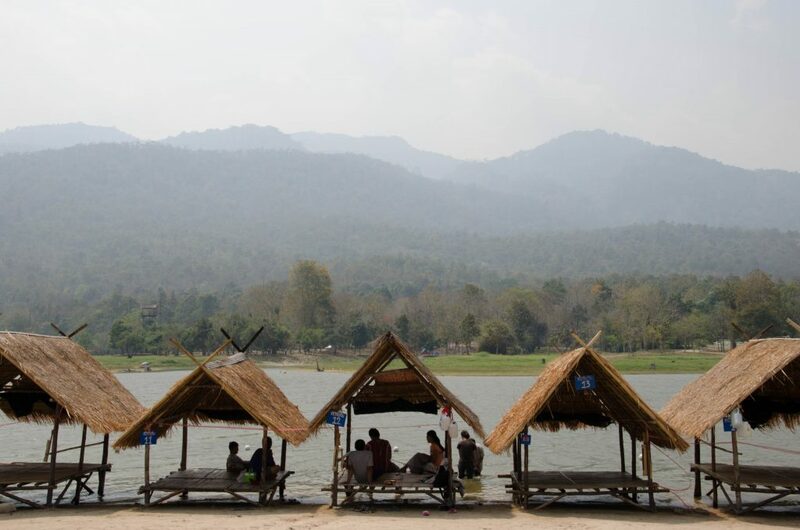 There are several bars around the lake with small, bamboo huts. You can eat some local food here, including fried frog, and drink some beers or whiskey. It is allowed to swim in the lake. The water is murky, but it is clean and you will see many locals having fun in the water on a hot day. There are tubes available, too if you fancy floating around. Directions: Drive on Huay Kao Road (road number 1004), past Maya Mall on your right, until you reach an intersection. Take the road 121 and drive for around 7 km. Pass 700 Years Stadium. You will see a sign to the lake. Turn left and drive for another 2 km. 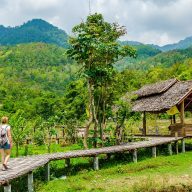 Chiang Dao is a bit further away and it takes around 2 hours to get there, so leave early in the morning. You can also take a local bus from Chiang Mai, from the northern bus station. I like this little town because it’s quiet and it seems like it is an undiscovered gem. Don’t get discouraged by the town itself, as it seems quite uninteresting. 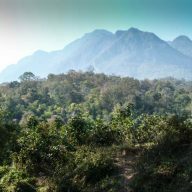 Head towards the Chiang Dao Cave for the beautiful view of the mountains and some nice places to drink coffee. The cave itself is impressive and one of the best ones I have seen so far. Entrance fee: 40 Baht, but you will need to pay 100 Baht to hire a gas lantern and tip the guide (it is advisable to hire one as the cave is huge and you can easily get lost). Directions: It’s easy. Just get on the road 107 and drive straight until you reach the town. To get to the cave, look out for a sign that will point you to the left and follow that road. This is a place my good friend Chris (who took these lovely photos and has a very nice blog, too) and I have discovered recently. 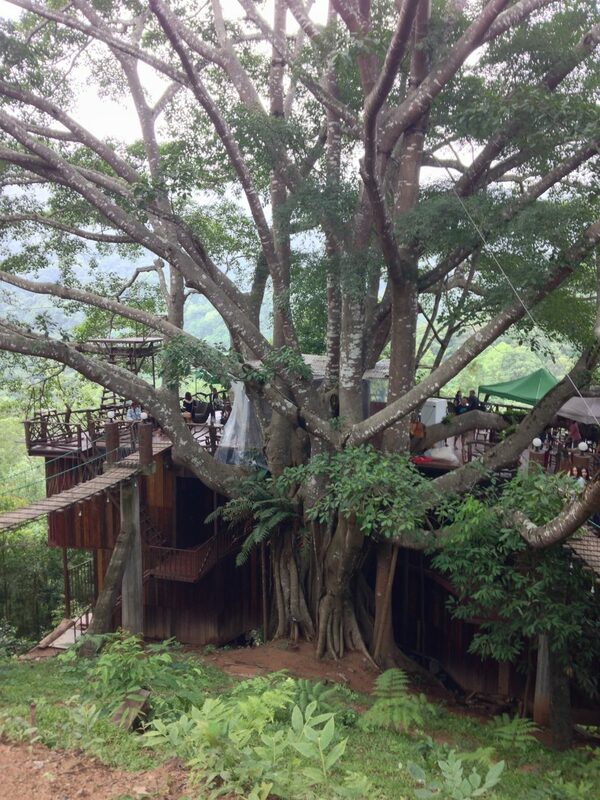 It is a coffee shop set up on a huge tree, overlooking the mountains and forests. I don’t think I liked it as much as the roads leading to it. The Giant is located 2 hours outside of Chiang Mai, and it is hidden deep in the mountains. On your way, you will pass some very picturesque villages with traditional Thai style houses, green gardens, small waterfalls and streams. This is Thailand you need to see! There are small gas stations on the way, a lot of small, local shops to buy water from, and some places to eat too. You can also stay overnight in one of the fancy looking bungalows. Due to its remote location I think it’s impossible to hire a taxi to take you there, so the only option is either car or a motorbike. Be careful though, as the roads are pretty steep and it can be dangerous during the rainy season. Opening hours: The Giant closes at 3:00 pm. Directions: Take the superhighway towards Chiang Rai, follow the road 1001, which after a while turns into road number 118. Follow that road. Turn right onto 3005 and follow it for about 30 minutes. You will get to an intersection, where you will see a sign for the Giant Cafe. From there follow the road all the way up. Doi Suthep hides a lot of quiet and beautiful places. Doi Suthep with its famous temple Wat Phra That Doi Suthep is well known and a must visit among first-time visitors to Chiang Mai. It’s a fairly easy ride up the mountains. 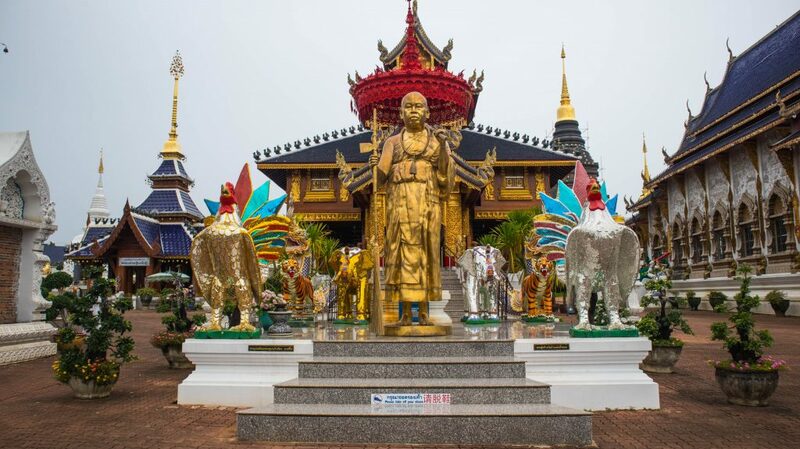 On the way, don’t miss various viewpoints and Wat Pha Lat – a very quiet, beautiful temple, hidden in the jungle. 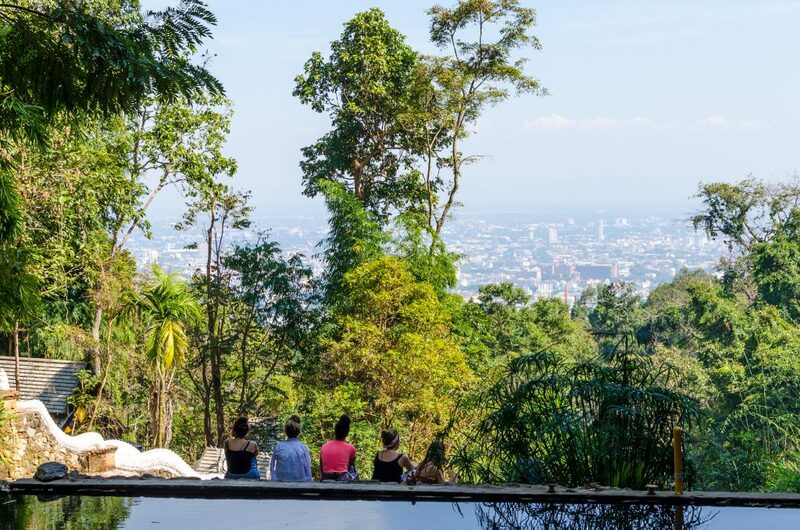 After visiting Wat Phra That Doi Suthep, continue up towards the Phuping Palace. You can stop here for a quick look at the gardens. After that, the road becomes narrower and a bit more dangerous, so drive slowly. 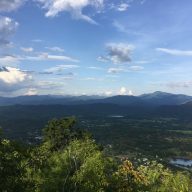 Here you can also stop at one of the viewpoints, drink a coffee at the Faculty of Agriculture of Chiang Mai University and then continue straight for 3 km to Doi Pui and a little village hidden on the top of the mountain. It’s a nice, pleasant ride and a great option if you want to escape the city. Mae Ngat Dam is located around an hour drive from Chiang Mai. It is a beautiful, quiet spot, surrounded by nature. Most know it for the floating bamboo houses. It’s such a great attraction. For around 2,000 Baht (a hefty rate for Thailand, but you can split it with a group of friends) you can spend a night on the water. A long tail boat takes you there and leaves you until the next morning. There are restaurants that sell food and drinks and you can go kayaking and swimming during the day. If you don’t want to stay overnight, then you can go for a half day trip. You then only pay for the boat. I went there a couple of years ago with a group of friends and we spent a day and one night on the water. It was a great trip. We all loved it. The second time I was taken by Take Me Tour with a local guide, Sakhon. We had lunch and stayed 2-3 hours on a floating bungalow – raft. Entrance: 20 Baht for entering the national park, 600 Baht for the boat, 2000 Baht for a bungalow. Directions: From Chiang Mai take the road 107. Turn right into the road 3038. 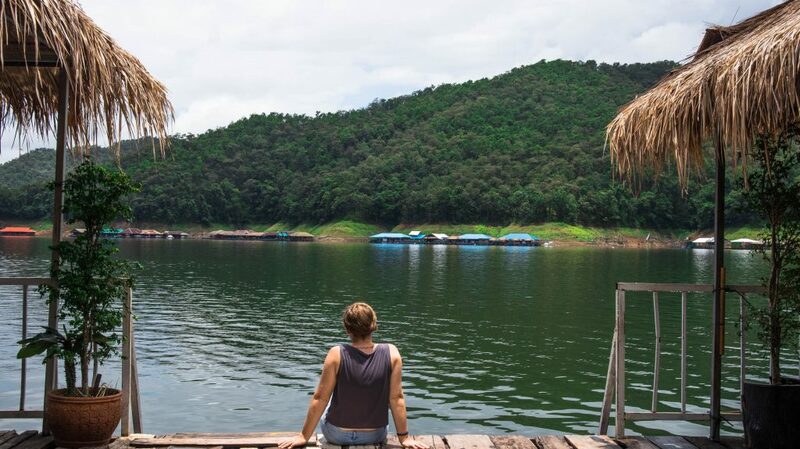 On your way to the Mae Ngat Dam, you can visit the Blue Temple, which is only 10 minutes away. It is quite an interesting piece of architecture. It’s a modern complex of buildings and the decor is colorful, rich and I’m sure that there are no other temples like this one in Thailand. The entrance is free and you can enjoy this peaceful place as long as you wish.